Mechanically actuated multiplate friction disc clutches and double clutches (8 sizes). Nominal torque moment range: from 25 to 1 250 Nm. .
LSV Double clutches are designed for reversal. 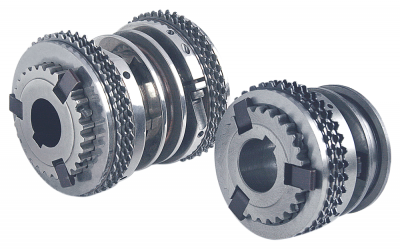 Both parts of the double clutch are controlled with one actuating sleeve and therefore they are suitable for gearboxes with frequent change of the sense of rotation. Maximum nominal torque moment - 1 250 Nm. Actuating and releasing is possible under full load. Simple construction of the double clutch is easy to control. Operation in lubricated or dry environment. Operating temperature range: max. +120 °C for the lubricated environment type.